Almost every American child of any age has seen at least a clip of the long-running PBS show “Mister Rogers’ Neighborhood.” The famous children’s show ran from the early 1960s all the way until 2001. Fred Rogers was the host and seemed to be a friend and neighbor to any child that was lucky enough to catch the show. Mister Rogers was a fixture of American culture and taught multiple generations incredibly valuable lessons. A documentary about the amazing life of Rogers and his show seemed long overdue. I’ll admit, I went into the film “Won’t You Be My Neighbor?” expecting a sentimental, fun portrait of the show and the impact it had on American culture. If that was all this was I would’ve been satisfied. Instead, I was blown away by how personal and challenging the film was as it portrayed not only the struggles of American life during the height of Rogers’ fame, but also his personal battles and vulnerabilities. “Won’t You Be My Neighbor?” showcases the behind the scenes aspects of Rogers’ show and how his message mirrored happenings in America rather than focusing heavily on the personal life of Rogers. Former cast and crew paint the portrait of Rogers as a kind and understanding man while delving into the history of the show. While Rogers was often focused on messages of positivity and kindness, he also addressed the challenging issues that were facing the country. In 1964, several black men and white men swam in the same Florida hotel pool to protest segregation. They subsequently had acid and chemicals thrown into the pool by the hotel’s owner to force them out. 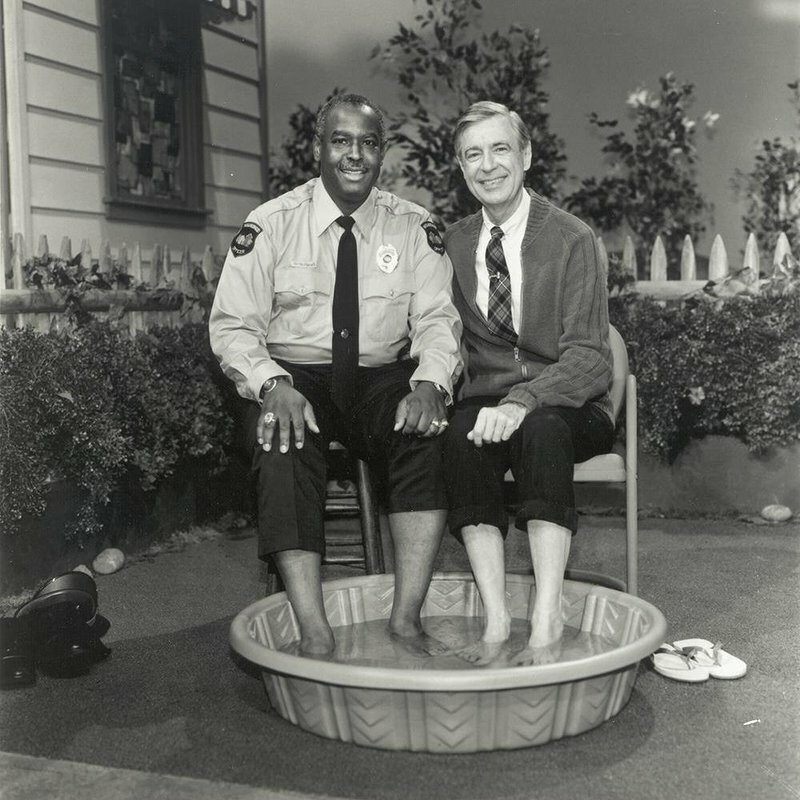 Rather than address the issues head-on, Rogers crafted a beautiful, yet subtle image where he invited Mister Rogers’ Neighborhood’s police officer, Officer Clemmons, to wash his feet in the same small pool as him. Officer Clemmons was played by African-American actor and musician Francois Clemmons. “Won’t You Be My Neighbor?” director Morgan Neville shows a heartbreaking juxtaposition between the scenes of acid being dumped into the hotel pool and Rogers and Clemmons washing their feet together. While Rogers seemed to be the most wholesome man in America, he was not without his own self-doubts and lack of confidence. Mister Rogers’ Neighborhood often featured a puppet character called Daniel Tiger. Many of those interviewed in the film believe that Daniel Tiger was an extension of Rogers himself and the character he turned to in order to express his vulnerabilities. After all, Rogers himself wrote, voiced and sung most of the characters in the “Neighborhood of Make-Believe” which was a part of the show that mostly featured puppets interacting with actors and low-budget sets. A moving scene in the film shows Rogers as Daniel Tiger singing a duet with main character Lady Aberlin about whether he is a mistake or not. Without giving away too much about those interviewed during this scene, it is clear that Rogers sometimes saw himself as too meek or not bold enough. It is an amazing look into a part of the man that no one really got to see by just watching his show. It was fun to take a stroll down memory lane with this film to remember all the great things that Fred Rogers was about and everything he created. While it would be nice to just leave it there and have happy thoughts about his show, the film seemed to ask a more poignant question at the end. Did we really take to heart all the lessons Mister Rogers was trying to teach us? Rogers actually returned to do PSAs about the September 11th attacks after his show had ended. It seemed we needed Mister Rogers to come back to give us advice even when his show was on a hiatus or gone altogether. Rogers was always ready to deliver a message, but it appears he sometimes questioned if his messages were working. He was often mocked and derided by right-wing pundits towards the end of his life and after his death about creating a “Soft” generation by spreading the message that every kid was special. What’s ironic about this is that Rogers was himself a Christian republican, and his message of everyone being special was really just a simpler way of saying that we’re all endowed by our creator. I loved this film and the emotional, inspiring journey it takes the viewer on throughout. While I don’t have a lot of vivid memories of Mister Rogers’ Neighborhood, I do remember one clip I saw as a preteen about always looking for help in times of trouble. It was actually from an interview with Mister Rogers, but I find it to be powerful and applicable to the world today. This message always resonated with me, and I leave you with the clip of this wonderful man and his sage advice.